In my last post I mentioned I'd had surgery, complications developed afterwards, and I was in bed recovering. I also said I was taking a break from knitting socks. Well, I am doing much better now, though the recovery has been a hard battle for me. I can walk again. That is the important thing. But I sure have developed a lot of empathy for folks who live in a wheelchair. I've had this lovely skein of Fearless Fibers Superwash Merino Wool Sock Yarn in the colorway called Deep Forest languishing in the stash waiting for the perfect idea. Socks for Frank fill the bill. It feels good to be knitting socks again. What beautiful color! I am glad to hear that you are feeling better and enjoying knitting again. Gorgeous colour - and it goes well with that patten too. 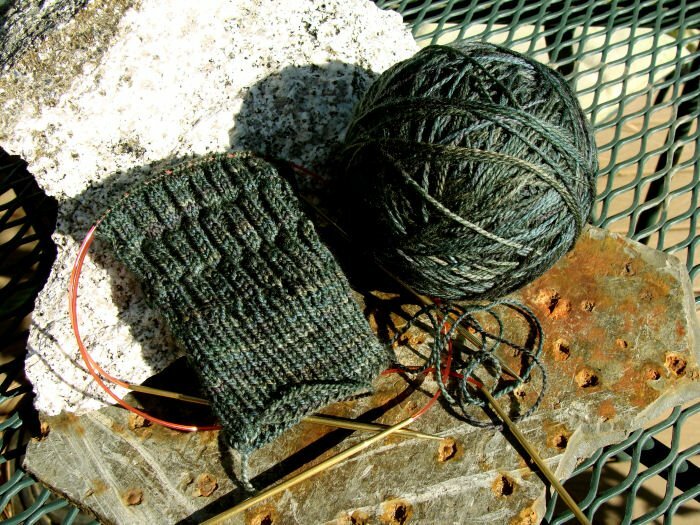 Glad to hear you have taken up the needles again - be well!